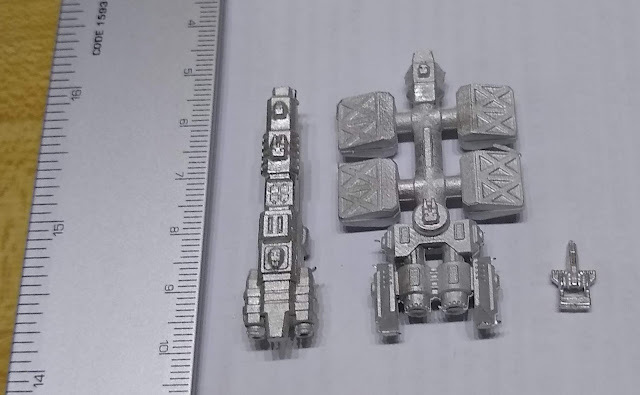 Midway through last month, I took advantage of the annual Brigade Miniatures holiday sale to order some bases and a few other things (it was pretty hard to resist testing out 15mm scifi, or getting a swath of space ships). I ordered on the 14th, and it made it to my house on the 24th, which is pretty impressive for international shipping, particularly during the holiday season. The main thrust of my purchase was to get these nifty bases that Brigade has for use with my Trek project. I figure these bases will be great for tracking drones, missiles, plasma, fighters, and shuttles. Each base is comprised of a metal hex with a die dock in the top, and a 3mm hole for a flight stem. 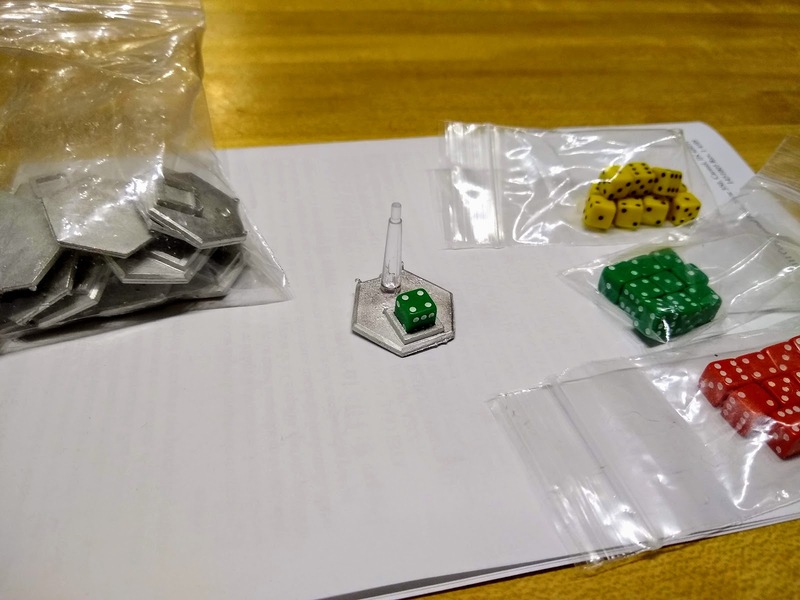 I got three varieties of micro dice to fit in the docks, and I will either use spare GW flight stems or buy some 3mm acrylic rod. Here is a sample of the fighters and other light craft. In addition to the "good guy" fighters, I got a transport and a corvette, as well as a pack of enemy fighters. Anyway, a great buy from Brigade Miniatures, and inches me closer to having a complete Trek gaming set. Now if only the magnets I ordered from China would show up. Those Dice stands are really cool. I've thought about buying that transport as well. Very "standard" and yet unique at the same time. Those space ships look nifty, I'm going to wishlist some. Long ago I wanted to do some ship to ship combat. I never settled on anything really and have a mixture of weird ships. Those ships look pretty nice. @Sean, a weird mix of ships is what unifying paint schemes are all about!